The courses here at AYPO Tech provide valuable information that will help water operators in Indiana to be more effective and successful. The available courses are approved by the State to provide the hours of education water operators need to renew their licenses. What are the CE requirements for Indiana water operators? At least 70% of the contact hours must be from the Technical category. All AYPOTech's courses listed below are approved as Technical and can help you renew your certificate(s). This 30 Hour CE Package is built for water operators with grades WT 4, WT 5 or WT 6. This package includes: Surface Water, Source Water, Disinfection, Corrosion, Membrane, Water Distribution Overview, Pipelines, Meters, Storage Tank, Wells and Water Distribution Quality. This 25 Hour CE Package is built for grade 3 water operators. This package includes: Surface Water, Source Water, Disinfection, Corrosion, Membrane, Pipelines, Meters, Storage Tank, Wells and Water Distribution Quality. 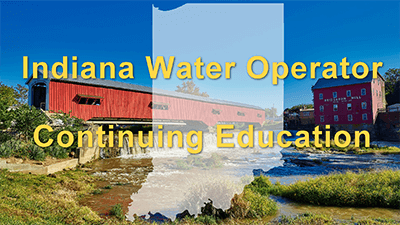 This course will fulfill 21 hours for Indiana Water Operators. This 21 hour package includes: Surface Water Treatment Plant Operators (3), Source Water Issues & Pretreatment (2.5), Sedimentation & Filtration (3), Coagulation & Flocculation (3), Disinfection (2.5), Corrosion Control (3), Adv. Oxidation & UV Disinfection (2) and Membrane Processes (2). This 15 hour package is built for Grade WT 2 operators. The package includes: Surface Water Treatment Plant Operators (3), Source Water Issues & Pretreatment (2.5), Coagulation & Flocculation (3), Disinfection (2.5), Adv. Oxidation & UV Disinfection (2) and Membrane Processes (2). This 10 hour package is built for Grade WT 1 operators. The package includes: Surface Water Treatment Plant Operators (3), Corrosion Control (3), Adv. Oxidation & UV Disinfection (2) and Membrane Processes (2).